What do you, your mom, a hip hop hottie, and a drunken gorilla with an accordion have in common? They're in your band! 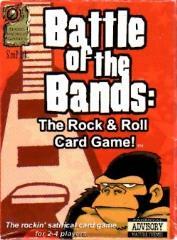 Get groupies, cut hit singles, do drugs, go on tour, and sabotage your competition all the way to the top with this funny and fast paced card game! Choose your band members from a collection of crazy characters! Get an instrument, get a reputation and become a star...or worse!